Preheat oven to 350 degrees . Coat a 10-inch fluted tube pan with nonstick cooking spray; set aside. In a large bowl, combine the flour, baking powder, baking soda, cinnamon, ginger, cloves and salt; set aside. Drain the sweet potatoes, reserving 2 tablespoons liquid. Place the drained sweet potatoes and reserved liquid food processor; process until smooth, scraping the sides as needed. In a large bowl, beat together the sweet potato puree, granulated sugar, 1 teaspoon maple flavor and oil with an electric mixer on medium speed until smooth and well blended. Add the eggs one at a time, beating well after each addition. Gradually beat in the flour mixture on low speed. Stir in the spiced pecans by hand. Pour batter into prepared pan. Bake for 55 to 60 minutes or until a wooden toothpick or cake tester inserted into cake comes out clean. Loosely lay a piece of foil over the top of cake pan for the last 10 minutes to prevent overbrowning. Cool cake in pan for 10 minutes. Invert cake onto cooling rack and remove pan. Cool completely, about 2 hours. To make the maple whipped cream cheese: In a large bowl, beat the cream cheese with an electric mixer on low speed to lighten. Add the cream, 3 tablespoons powdered sugar, maple syrup and 1 teaspoon maple flavor. Beat on medium-low speed until stiff peaks form. To serve cake: Dust top of cake with additional powdered sugar. 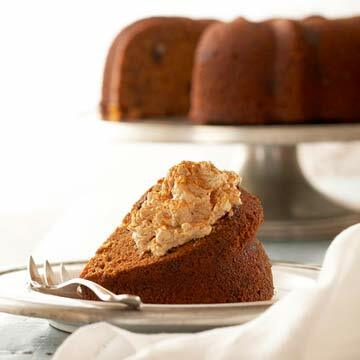 Serve cake slices with dollops of maple whipped cream cheese. Very lightly dust dollops of maple whipped cream cheese with ground cinnamon.